"To me the piano has become the instrument that offers the richest variety of modes of expression, both for experimenting with new formal and structural ideas and for inventing new sound visions in terms of color and harmony. The uncompromising exhaustion of extremes, the unlimited variety of emotional expressions, and the wide range of musical discourses can hardly be realized better or more radical than in restricting oneself to what a musician is able to demonstrate on this instrument. All culinary delusions available to a larger instrumental apparatus are omitted, only the essential remains: the spiritual core," wrote Michael Denhoff in his introduction to Hebdomadaire op. 62 (1990). The cycle is divided into four parts comprising thirteen pieces each, which are envisaged as a compact whole within each of the four parts, linked by formal, harmonious and other connections. ... In part three, Denhoff adds a few percussion instruments, a mechanical metronome and a voice, always, however, essentially integrated in the overall context rather than brought in for mere effect. The fourth and final book comprises an introductory part – ENIGMA (Motto) – and twelve so-called sound letters, a newly defined form for "coming to terms with the past musically:" The Sound letter on a tremolo makes Schubert's fantasia for violin and piano drift past, while Satie's Vexations emerge along with Liszt's late piano piece Nuages gris or Mahler's fifth symphony. And not unlike Schumann, who concluded his lieder cycles (in a quite autobiographical manner) by a postlude encompassing all that came before, Denhoff also claims the final word for his own, in the Sound letter on an echo (self portrait). 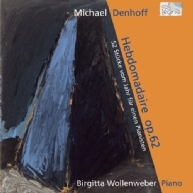 The German pianist Birgitta Wollenweber embarked on this highly rewarding journey through the pianistic year: remarkable piano music in an excellent interpretation. Vol. III. Young artists, young music. Listen intensely! Dizzying virtuosity, a dainty sense of harmony, an altogether highly original musical language in bright colors - these are the hallmarks of Rueda’s grand oeuvre.